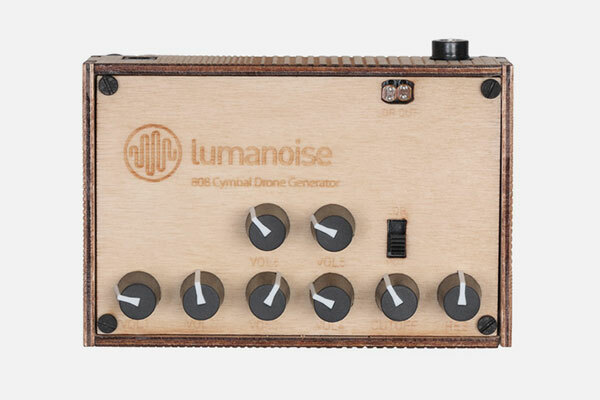 Based on the TR-808's cymbal circuit consisting of six oscillators tuned to different frequencies, L.E.P developed the 808 Cymbal Drone Generator. The six square wave oscillators are tuned to following fixed frequencies: 119Hz, 176Hz, 214Hz, 303Hz, 363Hz and 666Hz. Each oscillator's volume can be set with an individual potentiometer. The oscillator mix passes a resonant 12dB/octave lowpass filter that's cutoff frequency can be either controlled by a potentiometer or two photo resistors. Requires a 9 Volts (center positive) power supply - not included.